I was home a few weeks ago with a summer cold. Yes, a summer cold. With little energy to work, let alone cook, but a few deadlines that could not be missed, I soldiered on, fighting battles in my pajamas with my laptop balancing precariously on bent knees. Every once in a while, I would stumble to the kitchen for a fortifying meal. Cereal. Tea. Feeling adventurous? How about some toast? And finally, I had an appetite but barely more than a few scraps in the fridge. I pulled together all my creativity and threw together something fabulous. Wow. I didn’t know I had it in me. Throw arugula and roughly chopped scapes (or roasted garlic) into a food processor and pulse a few times. Slowly add olive oil and continue to process until a paste forms. Add lemon juice and salt to taste. 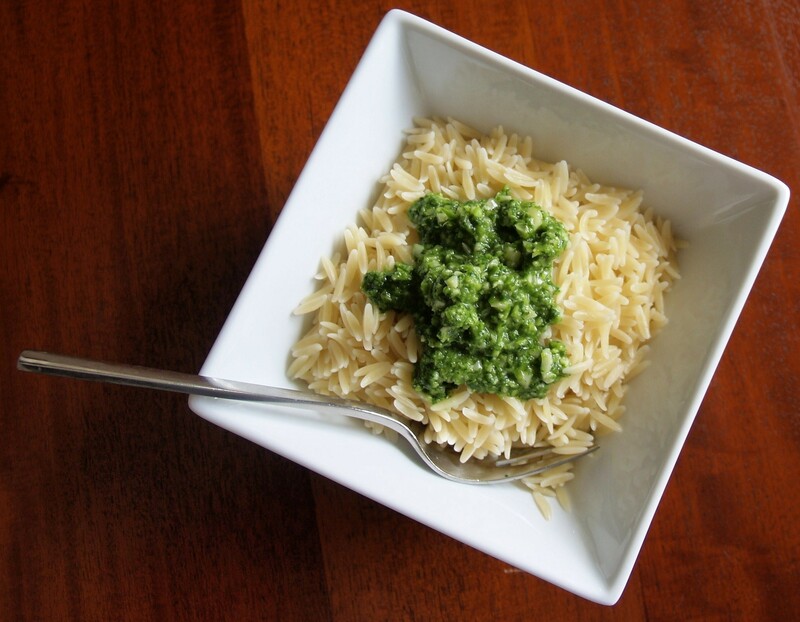 Add cheese and continue to process until you have a slightly chunky pesto. Make pasta (I used orzo) according to the package directions. I like mine al dente. Drain but don’t rinse. 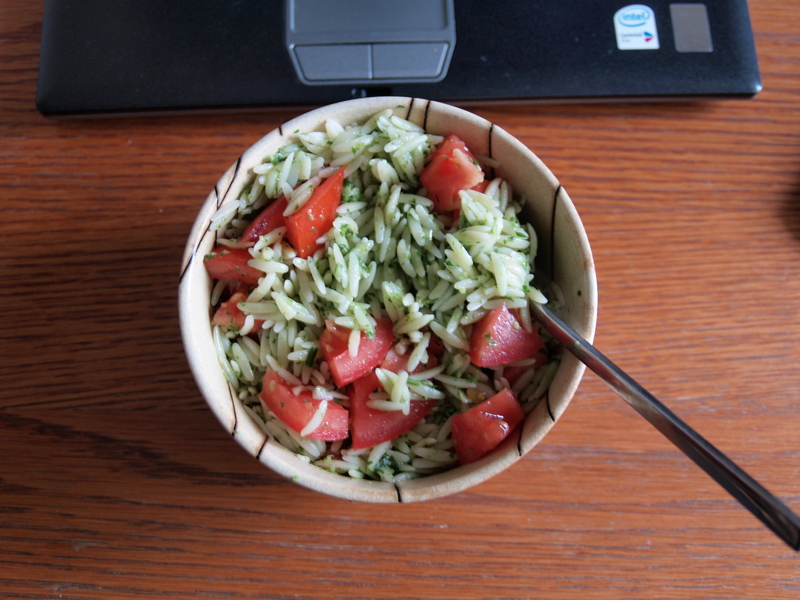 Toss with the pesto and chopped tomato while still warm. This is my second installment of virtual vacationing in Panama. You joined me two months ago for breakfast (where did the summer go?) — now let’s check out dinner. When two single women arrive in Panama, they can expect to be wined and dined every single evening. Without even making an effort. And when there are enough kosher restaurants to rival those in New York, you can bet that these two single girls were happy to oblige. Every night, gentleman would arrive at our door to sweep us away to a different restaurant. We met Panamanians, Argentinians, and Chileans. Sephardim and Ashkenazim. Religious and non-religious. Unfortunately, none of these gentlemen was memorable enough. 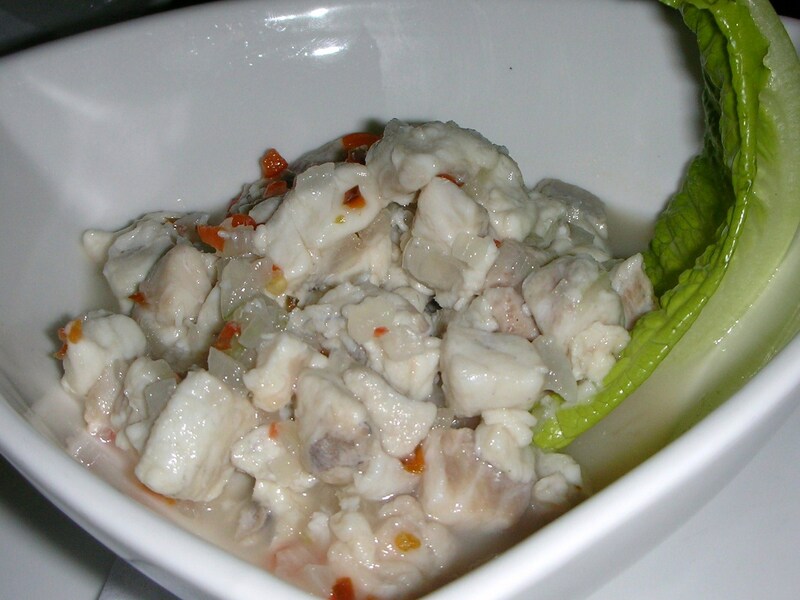 My favorite dish, the one that had me return to the same restaurant and request a meeting with the chef, was ceviche. I remember first trying ceviche in medical school when my Venezuelan classmate wanted to share with us some of her favorite foods. I was fascinated by the idea of cooking fish in the acid of citrus juice and since then, I have many variations with salmon and tuna. But the ceviche at Darna was the closest to my first taste of the specialty. I was determined to meet the chef to get the recipe, and on the morning of our flight home, I was able to do so. More on that adventure and the flight we almost missed later, but her is the recipe. 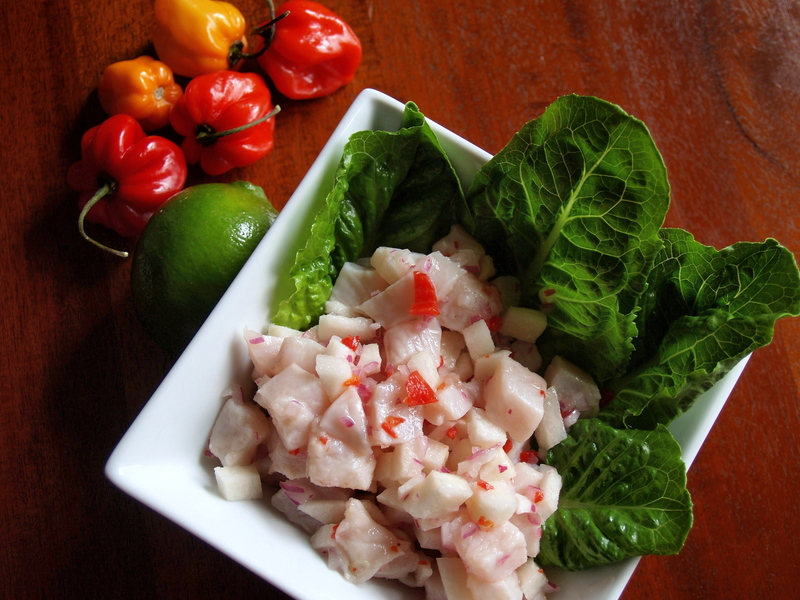 In Panama, this ceviche is made from corvina – a white, firm fleshed saltwater fish that Darna Chef, Ayelet, said can be replaced with grouper, seabass, halibut, or red snapper. Not finding any of these today, I chose talapia. Ayelet gave me the recipe as she makes it in her restaurants – in batches big enough for 10 with 5 pounds of fish and 20 limes (about 1 L of lime juice). 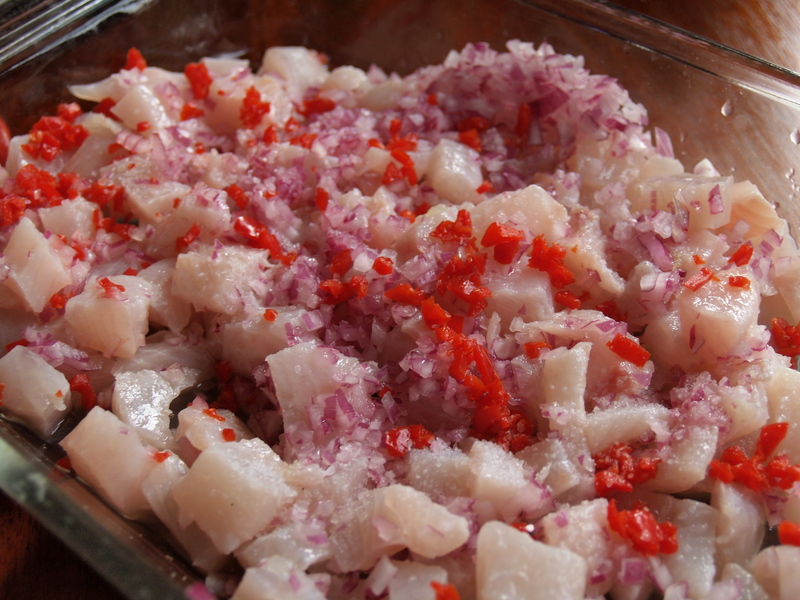 She explained that Panamanian ceviche differs from other South American ceviches in using more onion. I’ve adapted the recipe to serve 2-3 with a little extra poblano heat and replacing the celery with jicama. Dice fish into ~1/2-inch cubes and place in a glass on other non-reactive bowl. Add the lime juice and salt and mix. Chop the onion very fine and add to the fish. Wear gloves to chop the pepper very fine. Gently toss with fish and refrigerate for 3-4 hours before serving. Dice jicama into ~1/4-inch cubes and soak in a little bit of lime juice and salt. Refrigerate. Quickly I grew to love the rhythms, smells, and tastes of small town life. First in Mont près Chambord visiting châteaux most weeks and the corner bakery to pick up a baguette or a pain de campagne every morning. Then on vacation in Sables-d’Olonne in the Vendée at the grandparents’ rustic house where we picked our meals largely from the robust garden. Every other day or so, we went to the outdoor marché to buy only the freshest produce from vendors who has raised the fruits and vegetables themselves. 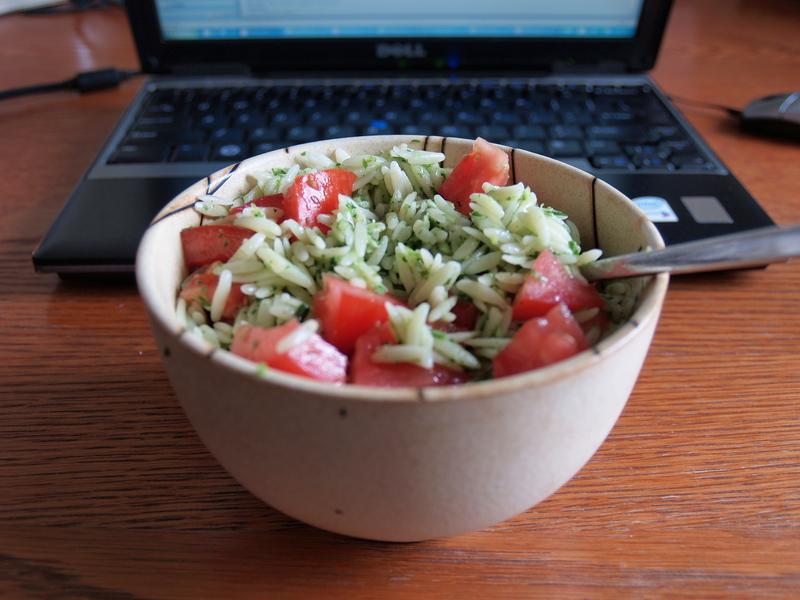 The tomatoes were redder, the haricots verts greener and skinnier than anything I saw in our supermarket back home. And the cheese. The cheese. It deserves its own paragraph. The stinkier, the better. The fattier, the better. As a girl who had been dancing for years and subject to scrutiny in front of the mirror, this was mind altering. I tried creamy cheeses. Nutty cheeses. Blue cheeses (still not a fan). Rind cheeses. Goat cheeses. I discovered I loved Bucheron, Gruyère and its French cousin Comté, Saint Marcellin, and of course Camembert. We kept le fromage out of le frigo at room temperature in a special cheese cupboard. I could could keep going. But this post isn’t about the cheese. 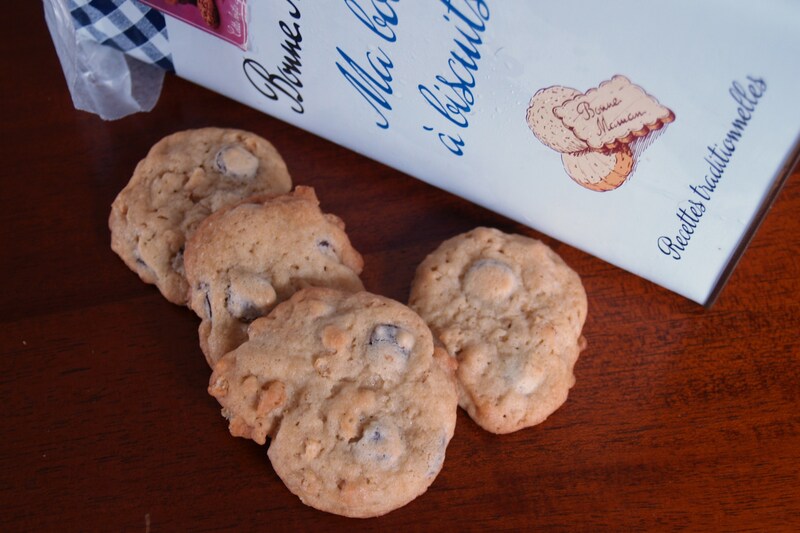 I had packed in my luggage a bag of chocolate chips and a recipe so I could bake for my French family an American classic that I often made with my mom. Gathering the rest of the ingredients and converting the recipe without measuring cups was a bit of a challenge. We got held up looking for baking soda in the grocery store. Until a bit of creative sleuthing (a halting conversation between me and the baguette baker) led me to the pharmacy for bicarbonate de soude. My French famille loved the cookies. So much, in fact, that we made several more batches even after the chocolate chips were gone, and not being able to find pépites de chocolat, bought big blocks of chocolate and chopped them into coupeaux de chocolat. And the grand-mère took to calling them “crokies.” The name stuck. I have lost the recipe that I brought with me to France, but this one is pretty close, adapted from Mark Bittman’s How to Cook Everything. The rice krispies are an homage to my mom who always threw them in our cookies and I love the crunch they add. These cookies are on the softer side, so if you like them flatter and crispier, add 1-2T water with the wet ingredients. Mix. Cream butter and sugars. Add eggs and vanilla, and beat until well blended. Add 1-2 T water if desired. Mix flour with baking soda and salt, then add it to the liquid ingredients and mix by hand. Fold in chocolate chips and rice krispies. Bake. 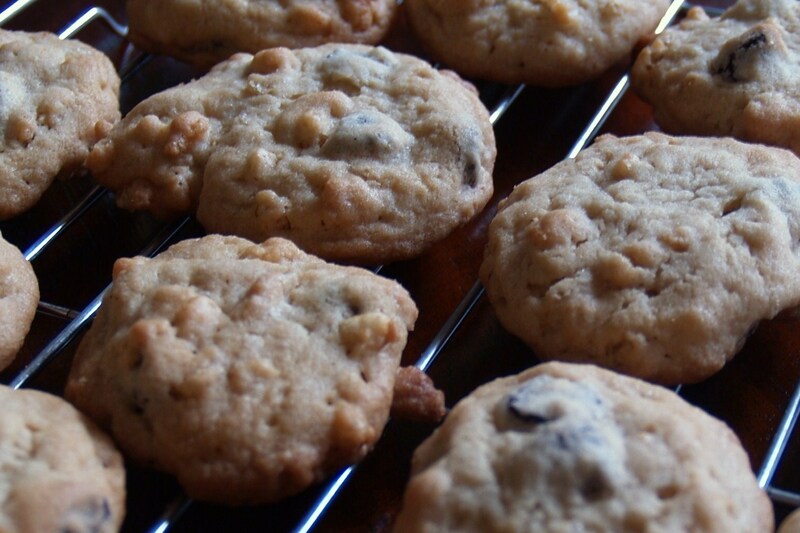 Drop cookies by scant tablespoonfuls onto a silpat- or parchment-lined baking sheet. Bake 10 minutes until lightly browned. Cool for a few minutes before removing from silpat/parchment and transfer to a rack. I keep my cookies in the freezer and think they are best eaten cold.